Start The Game With 30 Lives – Down, Down-Right, Right, Start in a smooth motion at the beginning of the game on the title screen. Infinite Lives Glitch – When you get to level 3, fight your way through the stage until you get to the mini boss “The Flying Squito Nest” (the mini boss after you climb the building). Make sure you have the machine gun as your weapon or this won’t work. Position your character as far to the left of the screen as you can and have him facing the right. Tape down the Y button and turn on your turbo mode. Set your controller down and come back in a few minutes to get a lot of lives (your lives max out when they get to 29). Start The Game With All Weapons – At the player selection screen, press Right, Down, Down/Right, Right, and Start. Level Select – At the player selection screen, press Left, Down, Down/Left, Left, Start. Spin The Screen – Briefly press L or R once, then hold the button in levels two or four. The screen will spin rapidly. 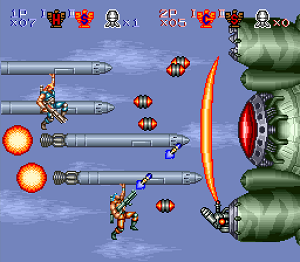 Double Weapon – Note: This trick requires a controller with a auto-fire feature. Begin game play and assign X to have auto-fire. The weapon selection display on the top of the screen will rapidly change. Once two weapons are collected, both of them may be used simultaneously. Note: The flame-thrower is not effected by this trick. Extra Lives – There are two locations on level 1 where your character can remain motionless to collect extra points and lives. After starting level one, your character will find a futuristic car. Do not destroy it. Jump over it and use it as a shield against the attacks that originate from the left side of the screen. Keep firing towards the right side of the screen, instantly killing all opponents that appear from that direction to collect easy points and the occasional extra life. Easy Weapon Change – Press Start pause game play and press X to change weapons. You will notice that your weapons can change even while the game is paused. Continue Game Play – Play the game in two player mode. After losing all lives and having the other player still alive, press A or B (depending on which mode) to return to life. There are a few things you can unlock in Contra III : The Alien Wars cheats they are listed below. 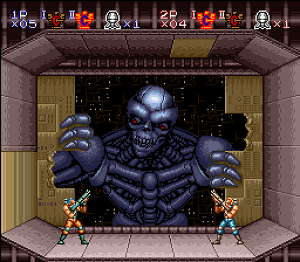 Alternate Ending Sequence – Successfully complete the game under the hard difficulty setting. Mini Gun – Select the Normal or Hard difficulty setting. Reach level 6 and the final Boss. Notice the different shapes moving around it. Shoot the one that resembles a spike and various guns and bombs will drop. Get under the Boss and wait until the gun marked with an “M” appears. Collect it to get the mini gun. Do you know anything you can unlock in this game that we have left out? If yes please let us know about it in a comment below.